Brenda is an intuitive & loving soul who not only explains the relevance of the colours shown in your photo but brings insight & understanding to any concerns through her developed psychic abilities & her connection with Spirit. You are truly one of a kind and so is your Aura. Your aura is as unique to you as your finger prints are. There are no two fingerprints or auras the same. Your core colour can tell your basic personality and your possible path in life. Your chakra’s tell how balanced you are. By looking at your aura and chakra’s you can work towards having a more balanced life. The webcam scans a picture of your aura into the software programme which assesses the colours throughout your aura and chakra. Brenda discusses what these colours mean for you and where you are at in your life and can take the information into a deeper reading for you. Brenda prints you copies of your aura and chakra levels that you can take home with you to compare to your next ones. As an Intuitive healer Brenda combines aura photos with either Reiki or Crystal Healings. She first takes your aura photo and discusses your results in regard to your chakras. Next Brenda will give you a healing treatment. Then back for a second aura photo to compare the differences. 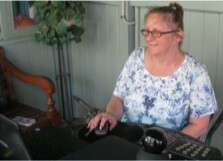 Brenda is an intuitive card reader using her developed physic skills in combination with oracle cards. Are you looking for something different for your next party? Brenda will bring her aura party to you. You just need to gather the guests and eats. There is a set fee for the Caboolture – Ipswich – Jimboomba area that includes up to 8 people. There is an additional fee for extra distance or people, just ask Brenda for details.